In late 2013, the Ministry of Land and Resources revealed that approximately 50 million mu (3.3 million hectares) of farmland was “moderately” polluted. In response, in late March, the Ministry of Environmental Protection (MEP) proposed its “Action Plan for Prevention of Soil Pollution”. In an interview with chinadialogue, Gao Shengda, secretary of the China Environmental Remediation Association, talks about the challenges of cleaning up China’s soil. Zhang Chun (ZC): Where does soil pollution come from and why have we seen so many cases in recent years? Gao Shengda (GS): Soil pollution comes mainly from mining and industrial activity. China’s 30 years of rapid economic growth have inevitably caused many environmental problems. Europe and the US saw the same thing during their periods of quick growth. Polluted farmland is more serious in provinces with mining areas: Hunan, Guangxi, Jiangxi, Guizhou, Gansu. In urban areas pollution is mainly due to heavy metal and petrochemical production. But that pollution isn’t just due to output for China’s own needs. In recent years many overseas manufacturers have moved to China and become major sources of pollution. The increased frequency of incidents is down to three reasons: first, soil and groundwater pollution is hidden, and previously it wasn’t a matter of concern. Environmental concerns start with what can be seen or felt: surface water pollution, air pollution. Only later does soil or groundwater pollution come to light. That’s been the experience in any country. Over the last two decades China has mainly been concerned with pollution of surface water and the air. Second, soil and groundwater have a certain environmental capacity – problems don’t become apparent until a certain degree of pollution has accumulated. Third, in urban areas soil pollution only came to light as industry moved out to make way for the service sector. In 2007, many urban industrial or mining concerns were relocated or shut down to make way for property development, but this exposed urban pollution. For example, in 2004, workers on Beijing’s Line 10 subway fell ill while working a site previously occupied by a pesticide plant. That made the public and the environmental authorities aware of the issue. Then there were similar cases with the Beijing 3rd Chemical Plant, Beijing Hongshi Paint Factory, Beijing Dye Factory, Beijing Coking Plant and Shougang Steel. But in urban areas there are no confirmed cases of soil pollution causing public health issues. The problem hasn’t been known for very long – it’s only in the last 10 years that this process has started, and identifying a causal relationship requires a long period of observation. That is unless there is a case of very concentrated pollution, such as the Love Canal case in New York, where homes were built on an industrial waste site, leading to a cluster of cancer cases over the following decades. ZC: What standards do we currently have for assessing and remedying soil pollution? GS: There are two types of soil standard, one for industrial and mining land, and one for farmland. There is a Soil Environmental Quality Standard for farmland, but this only covers two organic pollutants, Hexachlorocyclohexane and DDT, and eight heavy metals – cadmium, mercury, arsenic, copper, lead, chromium, zinc and nickel – and dates back to 1995. That’s currently being revised to include new pollution standards. It will set standards for levels of different pollutants in different types of land, and if that level is breached the land will be classed as polluted. So that single standard will apply in all cases. 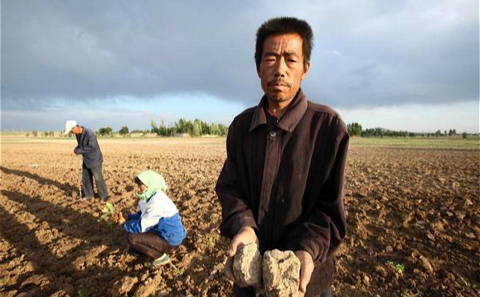 Soil pollution in China is quite serious, but there’s no remediation system and much polluted farmland goes untreated. There is no single standard for remediation of industrial and mining sites, or for urban land. Currently remediation of urban land is usually done to allow further development. The only standard was set in Shanghai, for the World Expo in 2010, whose site was formerly industrial land. Some provinces have used that as a point of reference for soil remediation efforts. Other places, such as Beijing, have opted to look to international risk models. This means first assessing risk factors and determining, based on the state of the pollution and the future use of the site, an acceptable risk index: for example, one case of cancer per million people might be deemed acceptable. You then work backwards, to see what level pollution must be reduced to. The lower the acceptable level of risk, the higher the standards for remediation. Under this model, the purpose of the site determines what level of pollutants will be classed as "polluted". For example, lower levels of pollutants might be required for a hospital or kindergarten, than for a factory. Currently this approach is common worldwide – for example in Taiwan, Korea and Japan here in Asia. And that would be the best way for China to get started. People are now aware of the risks of polluted sites, and now we should evaluate those risks. This is a flexible approach: the model may allow for some sites to be subject to less remediation, or to be left untreated. So it works both ways. At the end of February, the MEP published guidance on the survey, evaluation, remediation and monitoring of polluted sites, providing a standard procedure for dealing with pollution. This boosted market confidence and provided a good norm to follow. ZC: What factors contribute to the effectiveness of treating soil pollution? GS: First, is the particular nature of soil. Soil is unlike air or water. If you take an air sample, you can be confident that the air one kilometre away is more or less the same. But soil can change hugely within just a metre. So neither the public nor companies can approach soil pollution in the same way they think about air or water pollution. And each site is different. One chemical plant might have been operating for longer than another, but if its environmental standards are stricter then its site may be less polluted. In the north groundwater is very deep, in the south nearer the surface, and that changes how pollution migrates. There are differences in types of soil – sandy soil and clay need to be handled differently. There are also differences in the types of pollutants, and the abilities of the companies doing the work. It takes experience for a doctor to be able to write a prescription and tell you what medicine to take, how much, how often. Soil remediation companies also need to gather experience in assessing and treating soil, and in China these companies are only just getting started. It will take time for them to build up the technology, the personnel, the experience and the background. That’s a limiting factor. At the industry level, we need better technological skills. In the last ten years soil remediation work has mostly been carried out to allow for property development – usually soil is dug up and taken away for treatment elsewhere. That has prevented the sector developing a diverse range of approaches. Overseas it is more common for pollution to be dealt with in situ. That’s cheaper, but takes longer – from one or two years, to 10 or 20. ZC: How significant is the soon to be released Action Plan? What future trends do you expect to see? GS: Currently there are no laws or regulations on soil pollution, just a document from the Office of the State Council on short-term arrangements for protection and remediation of the soil, and there was also a circular from the MEP. There’s a real need for that action plan, just like there was for the air pollution action plan last year. But the action plan is still focused on farmland, as the state is mostly concerned with food security. And it’s a five-year plan; it won’t help put long-term systems in place. So there needs to be more powerful legislation, such as the Soil Pollution Law that there’s been so much debate about. The revision of the Environmental Protection Law will include soil pollution, but this is an overall law, it won’t be very specific. A specific law for soil pollution would be able to provide more actual detail. And China is huge, with big differences in soil, hydrology and geology. China could categorise pollution differently across regions, to allow for a differentiated approach. Also, China needs better monitoring of soil pollution, and to take action at any time. For example, with filling stations: you can’t wait until there’s a leak, or until the station is closed, to investigate. If fuel leaks it will pollute groundwater, and it’s cheaper to deal with that as soon as possible. If you wait a decade the pollution has spread. That means it does more harm, and is much more costly to clean up. Although "problems don’t become apparent until a certain degree of pollution has accumulated" - in relation to specific locations, and from the view of the people - they are anticipated in the law in so far as this specifies permitted levels of emissions. The costs of "problems" from pollution are likely to have been discounted by those complicit in exceeding such legal limits. Industrial hemp has been proven to perform phytoremediation (the extraction of toxic heavy metals) of contaminated soil, especially with cadmium content, and to deposit most of this toxic metal at the unusable part of the plant, the leaves, leaving the fibres uncontaminated. Hemp can perform as an alternative commercial crop for displaced farmers, due to its many uses, or as a rotation crop for future food crop cultivation. The benefit is that cultivating industrial hemp does not require pesticides or fertiliser, so will not add to the pollution of waterways. Industrial hemp has been proven to perform phytoremediation (extracting toxic heavy metals) of contaminated soil, especially with cadmium content, and depositing most of this toxic metal at the unusable part of the plant, the leaves, leaving the fibres uncontaminated. Hemp can either perform as an alternative commercial crop (for hemp textile) to displaced farmers, due to its many uses, or it can be used as a rotation crop for future food crop cultivation. The benefit is that cultivating industrial hemp does not require pesticides or fertiliser which will not add to the pollution of waterways. Do they even have the political will to do so? This obviously has to be in place before there will be any hope of them cleaning up their soil. Once they have it the others will follow rather quickly. As factories have moved out of Chinese cities, housing and public buildings have been built on contaminated sites. Bao Xiaodong and Zhang Xinyuan investigate. China’s sewage-treatment industry generates 22 million tonnes of sludge every year. What happens to it? Why should soil pollution data be kept a “state secret”? Former factory sites could help ease tensions between arable land and urban development – but first they need to be cleaned up. Robert Best reports on a nascent remediation industry.